Against the Grain has a new post titled Thoughts on Pope Benedict XVI's Spe Salvi ("Saved in Hope"). As always, Christopher Blosser provides links and information about articles and blog posts on the encyclical, providing a one-stop resource to find commentaries on the new encyclical. The only source I would like to mention that is not included in that post is Abbot Joseph, whose post titled Spe Salvi at Word Incarnate I found quite inspiring. On today's Feast of the Holy Family, the Holy Father specifically addressed those attending today's Celebration for the Christian Family in Madrid, as his words at the midday Angelus were broadcast live to those attending the pro-family, pro-life demonstration. Photographs of today's events in Madrid, as well as articles and the homily by the Cardinal Archbishop of Madrid (in Spanish) can be found on the event website. Thousands of people attended, filling the surrounding streets. "Thus, parents have the right and the fundamental obligation to raise their children in the faith and values which give dignity to human life. It is worthwhile working for the family and marriage because it is worthwhile working for the human being, God's most precious creature." Full translations are available from the Vatican and Papa Ratzinger Forum. An article is available from Asia News. For today's Feast of St. Stephen the Martyr, the Holy Father offered a reflection on the saint before praying the noonday Angelus. There was no Wednesday General Audience today. Translations are available from the Vatican and Papa Ratzinger Forum. Articles about the address can be found from Catholic News Service and Asia News. "It is always necessary to notice this distinctive feature of Christian martyrdom: it is exclusively an act of love for God and for man, including persecutors. At holy Mass today, we therefore pray to the Lord that he who 'died praying for those who killed him, [may] help us to imitate his goodness and to love our enemies' (cf. Opening Prayer)." In his reflection before praying the Angelus today, the Holy Father mentioned the new document on evangelization from the Congregation for the Doctrine of the Faith, known as "Doctrinal Note on Some Aspects of Evangelization." Speaking of the right of each Christian to spread the "good news" of the Gospel, returning what we have freely received, he said, "This is the true meaning of Christmas that we must always rediscover and live intensely." An article with quotations is available from Asia News. Full translations are available from the Vatican, Zenit and Papa Ratzinger Forum. The Vatican website also provides the texts of addresses by Cardinal William Joseph Levada and Cardinal Francis Arinze at a press conference for the presentation of the document. In today's last Wednesday General Audience before Christmas, the Holy Father set aside his series of catecheses about the great figures of the Early Church to talk about Christmas. He spoke of Christmas as reminding us of the birth of Jesus, and also reminding us of the exhortation "to await, in vigilance and prayer" His coming again to render justice. He encouraged "committing ourselves to prepare the way" for the birth of the Saviour, "to prepare for him a dwelling worthy not only in the environment around us, but above all, in the spirit." English translations are available from the Vatican, Zenit and Papa Ratzinger Forum. Asia News has an article. "Christian joy thus springs from this certainty: God is close, he is with me, he is with us, in joy and in sorrow, in sickness and in health, as a friend and faithful spouse. And this joy endures, even in trials, in suffering itself. It does not remain only on the surface; it dwells in the depths of the person who entrusts himself to God and trusts in him." Translations are available from the Vatican, Zenit and Papa Ratzinger Forum. Asia News has an article. In today's General Audience, Pope Benedict spoke about St. Paulinus of Nola. A contemporary of St. Augustine, St. Paulinus was a native of Aquitaine, in Southern France, who was a monk, then a priest and bishop in Italy. He was married to a woman named Terasia, and both of them chose to live an ascetic life of chaste fraternity, following the death of their son soon after his birth. St. Paulinus wrote poetry and gave particular attention to the poor. His theology is found in his letters of spiritual friendship, written to other saints of his era. The Holy Father said that his poems and letters "are rich with a theology that was lived, interwoven with the Word of God that was constantly scrutinized as light for life." From them, he said, "there emerges a sense of the Church as a mystery of unity," of communion lived "through a distinctive practice of spiritual friendship." Asia News has an article as usual. Full translations are available at the Vatican, Zenit and Papa Ratzinger Forum. The Pope spoke today at the statue of Our Lady near Rome's Spanish Steps, as he gave his reflection before the midday Angelus. He mentioned Mary and also mentioned St. John the Baptist, the subject of today's Gospel reading for Mass. Asia News has an article. Translations are available from the Vatican, Zenit and Papa Ratzinger Forum. "Through the Gospel, John the Baptist continues to speak down the centuries to every generation. His clear, harsh words are particularly salutary for us, men and women of our time, in which the way of living and perceiving Christmas unfortunately all too often suffers the effects of a materialistic mindset. The "voice" of the great prophet asks us to prepare the way of the Lord, who comes in the external and internal wildernesses of today, thirsting for the living water that is Christ." 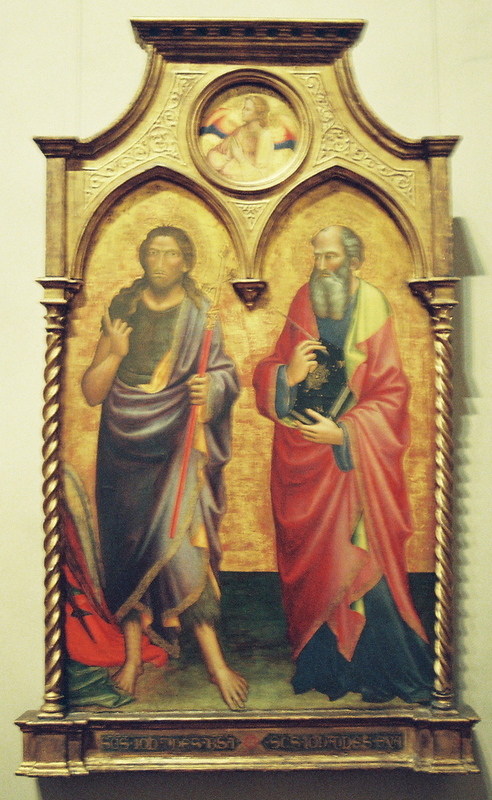 Picture: St. John the Baptist (left) and St. John the Evangelist (right), by Mariotto di Nardo, 1408. Photo by me. Museum information.